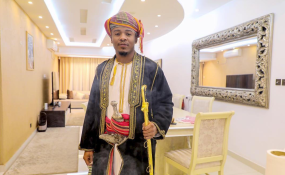 Tanzanian singer and socialite Kidoti Baby, has sensationally claimed that Bongo flava star Alikiba once asked for sexual favours from her but bolted when she demanded for cash in return. In a candid interview with MidOne TV, Kidoti claimed that the Seduce me hit maker is among numerous men who have tried hitting on her in the past via Instagram. Kidoti commands a huge following on Instagram with her account is populated with raunchy videos and semi nudes pictures, which perhaps explains why male admirers keep pestering her. Kidoti, who is also a video vixen, narrated how Alikiba - who is married to a Kenyan wife - first made contact with her on Instagram DM (Direct Message) at a time she was obsessed with twerking and uploading the videos online. "Alinifata kipindi kile napenda kujirekodi rekodi, nakata kata mauono nahisi alielewa game," recounted Kidoti. She further narrated how Alikiba then started flirting with her, telling her how much he liked her, especially when she twerks. "Akaja DM mtoto sijui nini eeeh ati nimemvutia navyocheza na kuwa anapenda wanawake wenye matako makubwa... ," Kidoti added. According to Kidoti, Alikiba than decided to take it a notch higher by asking if they could meet and have some fun but she wasn't ready because she thought when he contacted her, maybe he wanted to help her out in her music career. But it turned out, she says, Alikiba only wanted to use her. And when Alikiba persisted with his flirtatious overture, Kidoti decided to ask him for Tsh2 million (Sh88,200) in return of the sexual favors he so badly needed. It is at that point, she says, Alikiba that bolted saying he was a big star and he can always get any woman he desires without spending a single penny. "Yule bahili (stingy) sana kwenye kutoa hela. Jibu mimi nililompa nilimwambia kama anayo milioni mbili freshi, akaniambia mimi siwezi kutoa hela hiyo kwa mwanamke, mwanamke yeyote mimi nikimtaka nampata kiurahisi tu bila tatizo lolote. Alishindwa dau," Kidoti said.